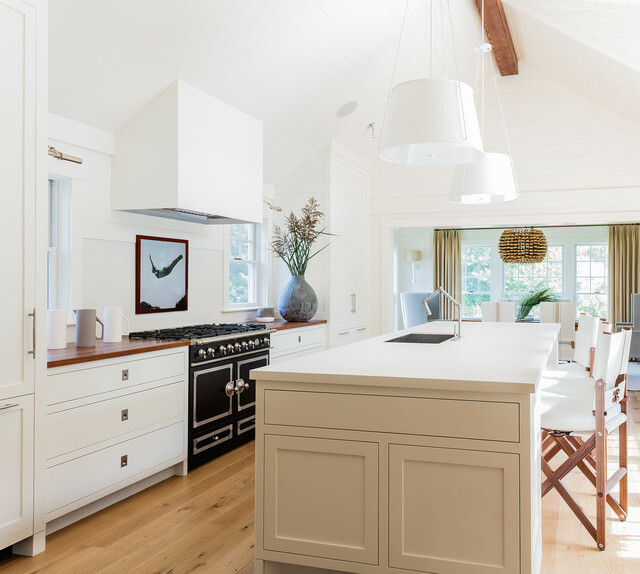 Kitchen renovation designed by Lisa Tharp. Yacht-inspired. Holly + Teak boat decking countertops. LaCornue range. Sailboat mast inspired pendant lights. Custom yacht counter chairs in leather and oiled walnut. Articulating faucet. Map-reading sconces. Neolith island countertop. Beautiful flooring - Could you give me the details for the flooring? It is absolutely perfect! I have been looking at Hallmarks Marina, Laguna and Heirloom Hickory but am having the hardest time deciding. Floors are beautiful reclaimed heart pine from Longleaf Lumber. Art work above range. Where it is from or can be purchased. Thanks for your inquiry. I fell in love with vintage swim photography at Coastal on Nantucket. Tell Karen and company we sent you. Beautiful work! What is the paint color? Hi Susan-The color is Farrow & Ball- Pointing. What is the source for the island counter? hello. This countertop is fantastic. It is a relatively new product called Neolith, Its practically indestructible and yet looks and feels gorgeous in person. It's a great alternative to the typical options available and the clients are very pleased with it.